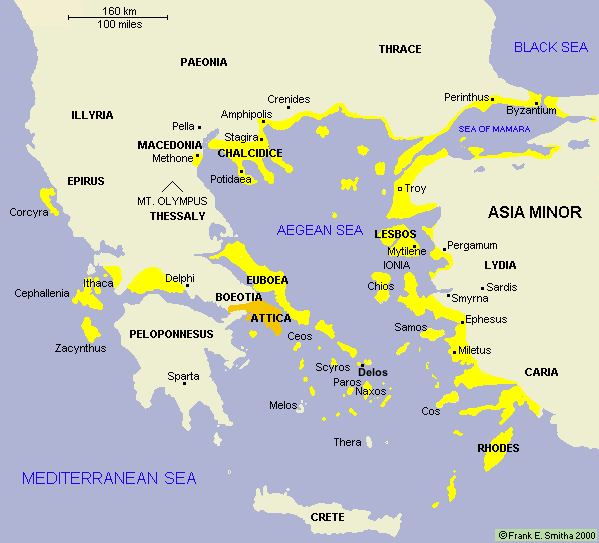 The Delian League, in yellow. Athens made it an empire, seeking opportunity and protection and believing empire a natural order for the superior. It was an age of people describing events in prose rather than poetry. The Greek writer Herodotus (circa 484–425) worked as a journalist and historian. His was a different kind of writing than would appear in the Old Testament's Book Chronicles. The writer of Chronicles appears to be conveying a religious message to peers in Jerusalem (men who could read). He delivered his message in the tradition of storytellers, beginning with Adam and Eve and eventually reaching David and Solomon. The last events in the Books of Chronicles were during the reign of the Persian Cyrus the Great, which ended in 530 BCE. Biblical scholars estimate that Chronicles was composed after Herodotus: between 400-250 BCE. Herodotus chronicled the Greco-Persian War, and he was to be a source for modern scholars. He was a Greek from what today is Turkey, the modern day city of Bodrum, then called Halicarnassus. He has been called the "Father of History" and described as the first historian known to collect his materials systematically and to consider the material's accuracy – hardly the method of ancient oral storytelling. Herodotus attempted to pass along to his readers information unadorned. This included geographical information and descriptions of local ethnicities. He was not writing to praise his gods as priest-writers had, but his view of godly interventions did slip into his writing as in his description of a storm that wrecked much of the Persian fleet as an intervention by Zeus. Unlike previous storytellers he admitted that he was conveying a personal point of view – that he was being subjective. But he wanted to be fair with those on both sides of a conflict. This made him vulnerable to the prejudices common among the Greeks, and they called him a "barbarian-lover." Herodotus described the Greco-Persian War like some in the 20th century were to describe the Cold War: a conflict between freedom and slavery. He saw the Persians on the side of slavery and the Greeks on the side of freedom. Writing about the wars between Persia and the Greek city states, Herodotus claimed to be reporting only that which had been told him, relying on his ability to dismiss what appeared to him as absurd. The problem was that people doing the telling were prone to myths that arose soon after an event. There was not a lot of sophistication around that put people on guard against confusing facts with pleasing interpretations. The Greek writer Thucydides was approximately 24 years younger than Herodotus and outlived him by 30 years. He chronicled the great war that followed the Greco-Persia of 499-49: the Peloponnesian War of 431-04. Thucydides is considered the first really modern journalist-historian. He surpassed Herodotus in recording events with precision and impartiality. He was an Athenian from a wealthy family and had been educated in rhetoric and philosophy. He must not be misled by the exaggerated fancies of the poets, or by the tales of chroniclers who seek to please the ear rather than to speak the truth. . . . most of the facts in the lapse of the ages have passed into the region of romance. At such a distance of time he must make up his mind to be satisfied with conclusions resting upon the clearest evidence which can be had. . . . Of the events of the war I have not ventured to speak from any chance information, nor according to any notion of my own; I have described nothing but what I either saw myself, or learned from others of whom I made the most careful and particular enquiry. (Quoted by Daniel J. Boorstin, The Discoverers, p 565.